Check the FAQ before posting a question! Great release , Percy ! I want to translate cards into another language. What programm should i use? I use SQLite Expert to edit the records (any sqlite client will do). Percy man, you are the BEST! Thanks very much!!! Thanks, and Percy i know you work hard but I sent you a message on you tube last month requesting Savage Colosseum and Graverobber's Retribution. THANKS FOR THE ARCANA FORCE. Next to enter the game is the Time Lord cards... right? kkk just kidding. Thanks again man. One more thing, could you send me your background? You mean background image? You can find it in the textures folder. How i update to 1022 if i have 1021? Please put the card "Damage = Reptile"? Didn't use it because of the watermark. Download the update (2nd download link in this post), open it with winrar and extract all the files into the folder where you have 1021. Why when i open 2 1022 i can paly with me but not with other computers?? I LOVE DRAGON! THANK YOU SOOOO MUCH! Thank you so much, Percy. Can you add some "Monster summoning video" from the Tag Force to this? so UFOroid fighter show up in the pics but not when u go to deck edit and search out for it dose anyone know why? When i copy from update folder to original folder it ask me for copy n replace option. It also happned with thumbnails and pics. Am I updating the wrong way?? Don't worry, you are updating the correct way. Overwrite all the files when asked. please help me am getting 5fps what shoud i do? is this a bug? i summon elemental hero prisma, n wana use its effect but i can't, n why is that? i still got elemental hero alius in the deck and elemental hero great tornado, nova master, absolute zero and the shining, why can't i reveal them using the prisma's effect to dump alius to the grave? there isn't any activate button popping out when i click prisma. It is a ruling. Prisma only works with monster that are specifically named. None of the fusion monsters you listed mention a monster name. I have a problem, how can i maximise the game resolution, i can barely read the text, also there is nobody playing here? percy thanks man u are the best!!!!!!! could i make a request? in game music when a player is winning or losing. anyway thanks for your great job! 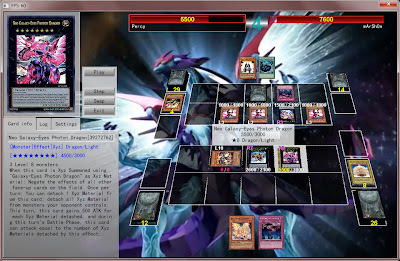 I dueled today with an opponent who used 3 Hieroglyph monster to xyz summon Neo Galaxy-Eyes Photon Dragon. I realised that the effects of my monster cards were negated even though Neo wasn't xyz summoned using Galaxy-Eyes Photon Dragon. Please verify and resolve the bug. Thx alot. "Golden Homunculus" and "Bazoo The Soul-Eater" For a D.D. deck. Awesome work you've done so far. can you put two different musics? one for the menus and another for duels. the bugs which have been in 1020 appear in this version again .. surrender button has been gone away .... problems about "without rules etc options .. http://img210.imageshack.us/img210/8049/58855365.gif "
at first i thought it would be a waste,but seeing you actually add features as duelists request them (surrender button,bleeping sound when a duelist connects,etc.) ,i would dare to give my humble opinion. 1=in deck constructor,there should be numbers which represent your monster count,spell count and trap count respectivelly.i think they can be arranged in the same line where your main deck count is written. 2=i have found that every game or online dueling system has the following pattern. extra deck below it.and thats what most people are used to.the current pattern is kinda awkward LOL. these were my humble suggestions.for a great programmer like u capable of making this system,they would be piece of cake. Thnak you very much man! Can you add internet duels in a new version? It is rather annoying to play via lan or hamachi. Is shooting quasar not yet legal in TCG? the application won't let me use it in TCG-only mode. Players can't use their Priority at BP and EP. I just confirm myself when playing Yu-Gi-Oh! 5D's World Championship 2011: Over the Nexus, and in that game, I only can use my Priority at MP. Please fix that bug Percy. Thx man. in that case, quasar is mistakenly being marked as ocg only. the text of dragon's rebirth also mistakenly marks it as ocg only. Maybe I didn't meet the requirements to activate monster effect. Sorry about that. I'll be more careful next time. Percy, how I can play, I made all things, create my deck, my name, but I can't play, how I can do?? Why do you not try out other options? Just choose TCG/OCG. me now currently working on adding some graphic feature by myself from yugioh online 3. anybody know how to extract the data from this game? Hey, I just want to thank you. You did an AMAZING job!!! Keep the good job! And sorry for my english! You will put monsters summon? Please fix Arcana Force - The Lovers, when toss a heads, card effect say it will be treated at 2 Tributes for the Tribute Summon of an Arcana Force but in YGO Pro, it still be treat at 1 tribute. when are the missing cards gonna be added? add please cards meklord parts like wisel top, wisel guard, wise core etc. i think ive found a bug, well, my opponent had 3 Dark monster in the graveyard which are all blackwing monster, and then it's my turn, so i monster reborn his Shura from his graveyard to my side of field to exceed with another of my monster into Steelswarm Roach, then proceed to his turn, now his graveyard only has 2 Dark monster, during his turn, he discarded his D.D. crow into the graveyard using its effect to banish 1 of my graveyard's card, so now his graveyard has 3 Dark monster, and he tried to special summon Dark Armed Dragon but was unable to, what does that mean? is it a bug or something? does his Shura that i special summon to my field still count as a monster in his graveyard? ive checked the ruling and nothing explain it. please if this was a bug, then il be glad enough to have found it and be fix by u guys as soon as possible. thx for the great game btw! ive found a bug with scarp chimera, i got a scarp beastt in my grave and its a tuner, so when i normal summon chimera, its effect allows me to special summon a scrap tuner from the grave but i wasn't able to, and nothing could stop me during that time, no activate or anything popping out to allow me to special summon, so i guess is this a bug? another bug, i ss my nepthys by tributing geib, but geib effect doesnt activate. .lol, is it because of i updated my ygopro with the horakhty's update? You do have 'Hieroglyph Seal of the God Dragon' in your deck right? I came across YGOpro a while ago, and really love it ever since. I like the automated system as I am not adept at yugioh card rulings, so I learn alot as I play. that's because your Steelswarm Roach' effect. Check wiki for Steelswarm Roach: This effect can only negate a Special Summon that do not start a chain, like "Cyber Dragon" and "Chaos Sorcerer". Hey man do u know why my FPS are too low ? 20 fps .-. will you ever add tag duel mode? Tour Guide from the Underworld does not match current configuration. Help. Ths host should select "TCG/OCG"
May I ask why I couldn't activate compulsory evacuation device during the Standby Phase to avoid the Rank 8 Dragon destroying my monster. it seems that you can only activate cards that are resolving as a chain. Swap Frog's Second Eff didn't allowed me to Set in addition ! "Once per turn, you can return 1 monster you control to your hand to Normal Summon 1 "Frog" monster, except "Swap Frog" or "Frog the Jam", in addition to your Normal Summon or Set this turn." Swap Frog allow you to Normal Summon in addition, not Set. is to make the game full screen? - 86489182 "Simorgh, Bird of Ancestry"
- 14989021 "Simorgh, Bird of Divinity"
Could you provide the full screen mode? Some people have problems with a window mode with Lua Programming. I attacked a face down Snowman Eater with Number 32: Marine Biting Dragon and I couldn't activate the effect. Why not? Don't know if this could help, but even if an opponent leaves or surrender, the duellog is still saved as "Last_Replay". If you don't have time to printscreen, you could tell the victor or the loser to send their last_replay to confirm. You could hold the left button of your mouse when you want to active a card at a phase. Don't know why there are many people who still don't know about this. For those people who are having constant low fps, try this, turn off User Account Control, open ygopro, then go to task manager, search for gframe (your ygopro program) then right click on it, click set affinity, then you will see a box popping out, untick others accept 'CPU 1' and click ok, the fps will stay around 30-50, that's even better than having 1-20 right? so that's it! hope these help =) it works with mine, low fps problem solve! btw, don't open too many unnecessary program in the background, they will drop your game fps. use for example game booster to close unnecessary program if you are not experience enough. does it work for mac???? in addition to your Normal Summon or Set this turn. ithought i can set :-? ?!? Hey Percy, do yout know if in the future can be possible Double duel or chat in the room?? Thanks for your nice work. Can you please add in Mirror Gate, I need it for my deck, lol. How do to increase my fps (frame per secound)? Glitch/Bug: You can Special Summon "Cloudian - Nimbusman" through "Summon Cloud" which says you can only summon a Level 4 or lower, but Nimbusman is a Level 5 Monster. Machina Fortress's effect doesn't trigger because Junk Berserker's second effect doesn't target. Glitch: When a monster's attack gets decreased to 0, its actual value is a negative number, so when its attack gets increased, its the increased number - the negative number for example, When marshmellon's attack gets decreased by photon's butterfly assassin to 0 (actual is -300) and later assassin (2100 atk) attacks the marshmellon, and the owner of marshmellon uses honest, it should gain 2100 atk, however it only gained 1800. Excuse me, but I have a very annoying problem with this game. Every time an attack is declared the game crashes please help! Sir can you give the updated link for july 2012 ? Umm can you also give me the link on how to download the game? There´s a problem with Hieratic dragon of gebeb effect, please fix it. What problem do you have with Hieratic Dragon of Gebeb. Please explain it. I think there is a ruling discrepancy between Rivalry of the Warlords and Advanced Heraldry art. I witnessed (in a youtube video) a player Using [AHA] to summon two [heraldic leo] and then xyzing into [nobleswarm beelze]; while the opponent had [Rivalry] Active on the field and not negated. I should first mention that i am unsure on these rulings, as they are not mentioned in either the [Rivalry] nor the [AHA] Rulings pages. I must also mention that This video was posted before this recent patch and may have already been fixed. As always, thank you for reading all of these and working on this. http://yugioh.wikia.com/wiki/File:SoulTaker-OW.png 'like you did with card of sanctity.